It works just like a typewriter keyboard, only it keys your rig as you type. All standard letters, numbers and punction are just as you would expect to find them in typing. All the common procedural symbols (prosigns) are available, too, and you can even create others by hitting the CTL key to delete the space between two characters. Click here to see a scan of the special key assignments. 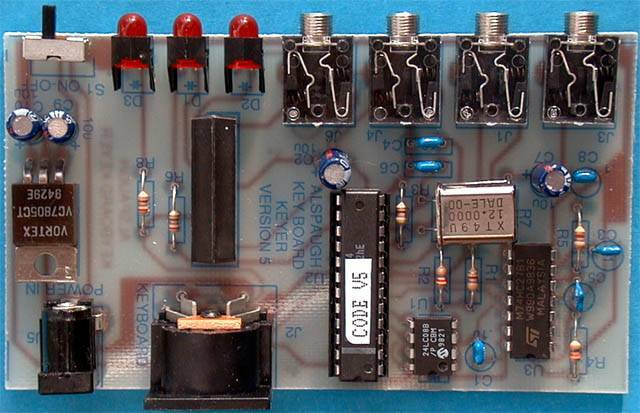 The keying circuit uses a relay, so the board doesn't care if you are using a positive or negative key line. The encoder's circuit board measures 4" x 2.25" (yes, the image above is considerably larger than life-size!) so you can attach it to the keyboard, or even build it into many radios. It even comes with two 3.5mm plugs so you can connect it to your radio and get started immediately. 1. CW speed to 79wpm. 2. Optional Farnsworth timing adjustment. 3. Four non-volatile storage buffers (message memories) of 250 characters, 1K total. 4. Two external beacon inputs to trigger two of the storage buffers. 5. Manual key input which interrupts automatic sending. 6. Power switch and LED indicator. 7. External side tone oscillator for modified frequency capability. 8. Side tone output jack for headphones or external amplified speaker. 9. 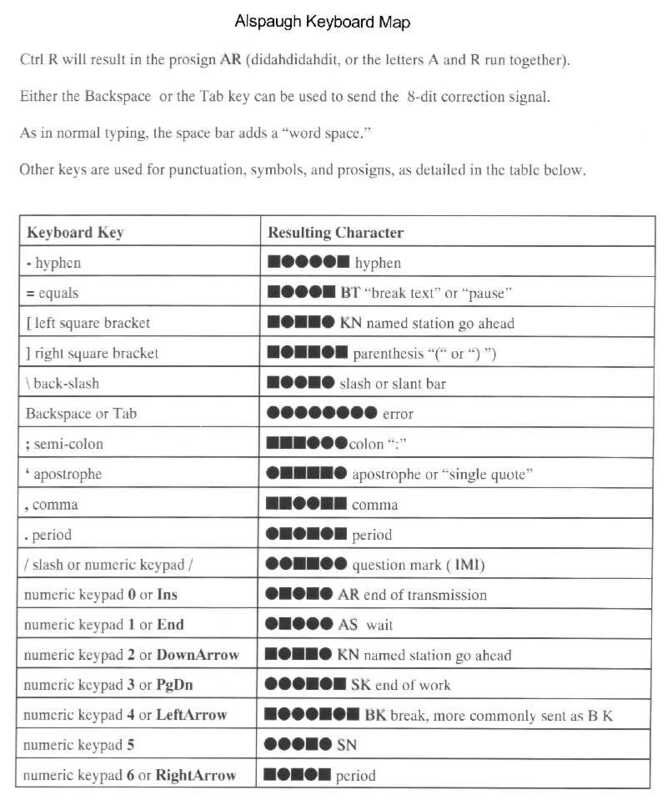 Keyboard buffer (type-ahead) 18 characters. and correctly shows status when using storage buffers. acknowledge. Improves compatibility with some rare keyboards. Jameco B5004 die cast aluminum enclosure, P/N 11965 or Hammond 1591BSBK. that it would take up a complete qst edition. If you are a user of the keyboard encoder, your comments could be here! Write to via the link below, and please be sure to say specifically that we can use your comments on the web page. Sorry, the Sprites are all gone. We may introduce either remainders or new production runs of the 2002/3 key style as a new Sprite, if there is demand for them. This page will remain available for a while for historical purposes. Our 2001 Christmas Key was so popular as a mniature telegraph key for genuine use, we decided to release it as a standard stock item. 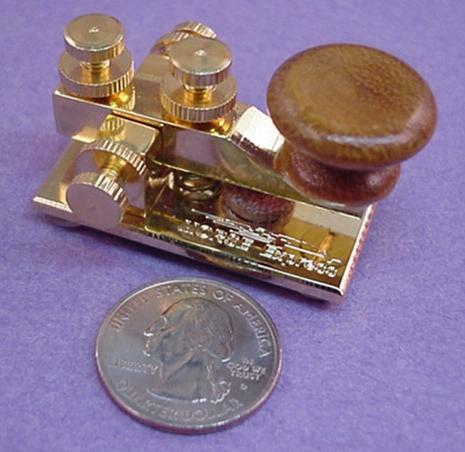 The MX Sprite is a fully operational miniature key, hand machined from solid brass and plated in gold. It measures a tiny 1 3/4" by 15/16" at the base and weighs a mere 2 Oz. Designed by Marshall Emm, N1FN, the Sprite was a challenge for European key maker Llaves Telegraphicas Artisanas. All the usual adjustments (trunnion bearing tension, lever spring tension, and contact spacing) are available by means of gold plated screws and matching lock nuts, and the indented knob is very comfortable in use. All of the machining and assembly processes were done by hand. The result, according to Marshall, is “a pretty little key that is eminently usable for sending code. It’s the smallest key we sell, and one of the smallest we’ve ever seen, so it will be very handy for QRP portable operations. " The base of each key is engraved with the Morse Express "Speedy Key" logo.